Edit: I found my clipboards at WalMart for under a $1 each. Ever since the girls started school, I have loved making gifts for their teachers. A good teacher deserves recognition and needs to be told they're doing a good job. 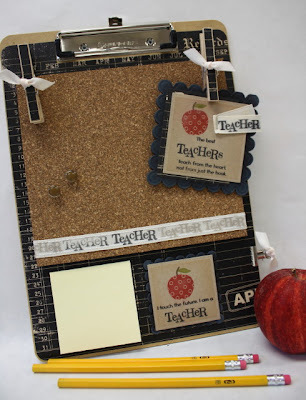 The Papertrey release count down is on, and Nichole has designed a new set called Teacher's Apple. It's the perfect set for teachers of all grades. I know it will be a *must have* set for many of you! Today I have a clipboard and a matching card ensemble that I'd like to show you. I've made many versions of these but I think this one is my favorite. Start with a clipboard and a piece of 12" x 12" patterned paper. Cut your patterned paper to fit your clipboard. It's best to measure your clipboard because different brands vary slightly in size. Cut a rectangle out of your patterned paper so that it fits nicely around the metal clip. Round the corners of your patterned paper. Using Mod Podge and a foam brush, cover the back of your patterned paper and place it on the clipboard, making sure to smooth our the bubbles. Let this dry completely. Apply a top coat of Mod Podge to the clipboard to seal and protect the patterned paper. Using Vintage Cream Saddle Stitch Ribbon and inks, stamp the word *Teacher* onto the ribbon. I used black ink and Distress Ink in Frayed Burlap to give the words a worn, vintage look. Adhere the ribbon strip to a square of 1/4" thick cork board. You can find this at your local craft store. My cork board was cut down to a 7" x 8" rectangle. Set aside to adhere to the clipboard later. Time to make a stamped embellishment. Using Papertrey Kraft cardstock, stamp an apple image complete with leaf and stem and a sentiment. I used Papertrey Pure Poppy for the apple, Dark Chocolate for the stem, Ripe Avocado for the leaf and Palette Black Noir for the sentiment. Cut the image out with a Spellbinder's Square Die Template. Tip: To keep the metal die template perfectly in place, use a piece of Scotch tape to adhere one edge of the metal die to the cardstock. Run through your machine as usual. Emboss and add a little distressing ink to make the image look vintage. Cut a scallop square mat and ink with white ink. This piece will be adhered to the clipboard with pop dots. Adhere two small scraps of patterned paper to clothespins. Cover with Mod Podge. Tie with Vanilla Cream twill ribbon. Once you've adhered the cork board to the clipboard front, adhere the clothespins to the corkboard with a strong adhesive. I like using Zip Dry. The little clips will hold notes, photos, quotes, etc. Add other embellishments such as metal clips tied with Vintage Cream twill. A few layers of sticky notes will stick to the clipboard also. I also made a matching card for the teacher using the same techniques as described above. By folding the black cardstock in half, you can create a scallop shaped card. Just make sure the die overlaps the folded edge of the cardstock so that it keeps intact and makes a fold. And here's my finished clipboard and card ensemble. All the pieces come together pretty quickly and it's a FUN project to make! Just allow plenty of drying time between the Mod Podge coats. Tip: Use weighted items like big punches to sit on the corkboard so that the edges all stay down when drying. You could totally change up the look of this clipboard from vintage to primary colors to green apples, etc. The possibilities are endless. I took a photo of the clipboard nestled in with some school supply baskets of the girls. I can see already that the teachers will LOVE their Christmas gifts this year. Awesome and so inspiring! Thank you, Michelle! Speaking as a teacher, any one of us would LOVE to have this!! You're the best! These are awesome gifts, wow, no wonder the teachers love to see you come! I left an award for you on my site. Whoa!!! What a cool gift Mish!! 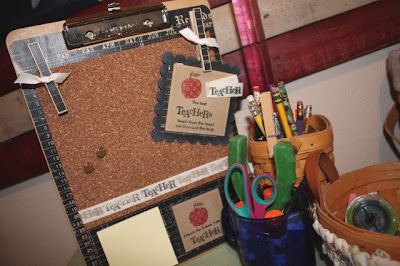 The teachers will go gah-gah over these clipboards....GREAT idea!! HUGS!! This is a fantastic gift. thanks for the detailed photos so that we can re-create it. Thank you for the great instructions and photos. This is a fabulous project that I'm sure teachers will love (and moms too because I'm making one for my kitchen). This is awesome and I do believe they will love them. That set looks to be alot of fun I do believe. This is gorgeous! I'm putting together a Handmade Gift Guide of teacher gifts and I'll be linking to this! Michelle - you amaze me! You are such an all around talented individual! And it's obvious that your projects come from the heart, whether it's a card, a yummy treat package or an altered clipboard for a teacher! You inspire me! This is so neat, Mish! I love how distressed it looks and all the details you added. Definitely a favorite of mine! I'm a teacher (too) and I do believe I would cry if a student gave me something that beautiful!!! This is gorgeous! I love your color scheme and all the embellishments, especially the custom clothespins. This is fabulous! I'm well stocked on mini clipboards, but I love your full size version. The teachers would LOVE this! TFS! very cool - I like the black and red together - the clipboard is a great idea! I see so many uses with this just by changing the paper etc. Just beautiful!!! Also--I really really appreciate the scotch tape tip!! I was having trouble with the slipping!! Thank you! Thank you!!! THANK YOU!!! What an amazing gift - way cool! The teachers will love these! You were the Craft of the Week at Card of the Week.com. You can see the original post here. What an impressive project! I love every little detail you've included! i love it! What a fantastic project! I have not children - hence no need for teacher gifts here - BUT - WOW is that fabulous... I can see using this as a spring board for other gifts.... From office to kitchen - love it, love it, love it... did I say I LOVE this??? Thanks for sharing this creative masterpiece!!!! This is gorgeous! My kids are too old for this (high school, and boys), but I do have friends that are teachers! Thanks for all of your inspiration! These is super cute love love these ideas! What a fabulous project - TFS! Oh my! This is just BRILLIANT! Great job!